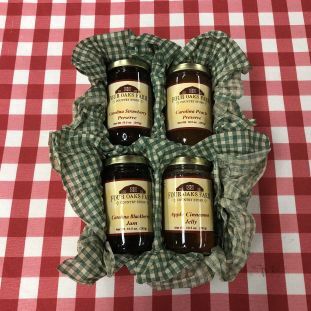 Four of our most delicious, best-selling homemade preserves and jellies. Contains one 15.5 oz. Jar Strawberry Preserves, one 15.5 oz. Jar Peach Preserves, one 15.5 oz. Jar Blackberry Jam, and one 15.5 oz. Jar Apple Cinnamon Jelly.